Can A Top-down Freezing Core Explain Ganymede’s Magnetic Field? The Jovian moon Ganymede possesses an internally generated, present-day magnetic field. This finding was one of the most unexpected ones during the Galileo mission back in 1996. 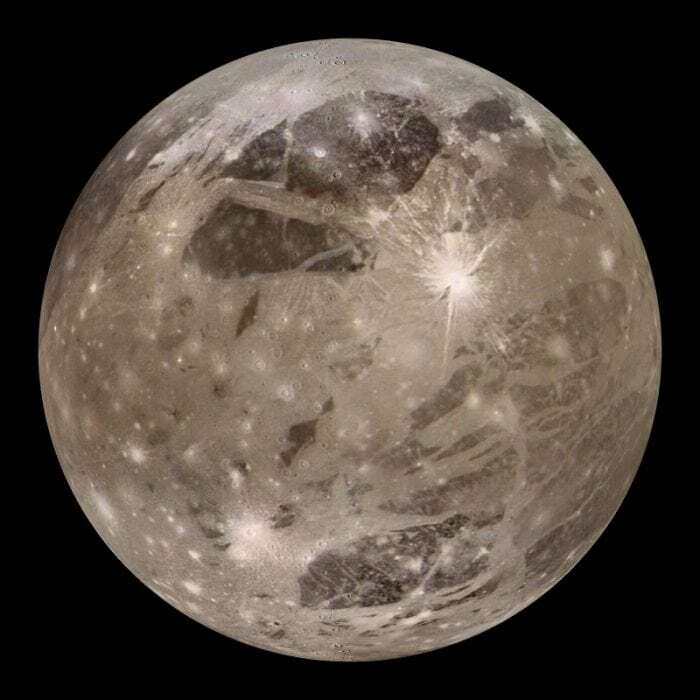 Ganymede is an icy moon, i.e. water makes up 46-48% of its total mass. A thick icy shell (900 km) forms Ganymede’s outermost layer beneath which a rocky mantle resides. The innermost part likely is a metal core. While scientists came up with different explanations for the origin of Ganymede’s magnetic field, the most likely source region is the metal core. Since the middle of the twentieth century, it has been known that complex fluid motions of liquid metal can lead to a self-sustained dynamo in planetary cores. Such a magnetohydrodynamic dynamo converts kinetic energy to magnetic energy based on the principle of electromagnetic induction. As a result, small magnetic field perturbations are amplified and lead to a magnetic field of finite amplitude, which eventually is measured by space missions. However, not every planet or moon with a metallic core exhibits a dynamo. A common observation is that terrestrial bodies smaller than Earth such as Mars, the Moon, and possibly certain asteroids only show signs of an ancient magnetic field but lack magnetic activity, today. In this respect, Ganymede’s present-day magnetic field is surprising. One important prerequisite for the core dynamo is the motion of the electrically conducting liquid (kinetic energy). The most likely source for generating kinetic energy in the metal core is via thermo-chemical convection. Thermo-chemical convection implies two driving mechanisms for fluid motions: thermal convection due to temperature differences (e.g. boiling water in a pot on a stove) or compositional convection due to compositional differences (e.g. sinking milk in coffee). A thermally driven dynamo can usually occur during the very early evolution (4000-4500 Myr ago), but is much harder to maintain until the present day especially for such small planetary bodies as Ganymede. This highlights the importance of compositional convection to explain the present-day dynamo of Ganymede. Compositional convection in planetary cores is often linked to core differentiation, i.e. when parts of the core become solid and thereby release buoyant light elements. The existence of light elements in the core is crucial to compositional convection. Seismological observations of Earth’s core have shown that it consists mainly of iron or nickel and some light alloying elements such as for example sulfur, oxygen, hydrogen or silicon. All these elements are abundant in the Solar System and are therefore assumed to be also present in the metal cores of other planetary bodies. Although the exact composition of the core is unknown, the most studied composition is a mixture of iron and sulfur (Fe-FeS). While Earth’s core freezes from the bottom to the top by forming an inner solid iron core, experimental work on low-pressure Fe-FeS alloys suggests that core freezing might proceed very differently in small planetary bodies such as Ganymede. The cores of those small bodies likely freeze from the top to the bottom. A recent study by researchers from DLR (Rückriemen, Breuer, and Spohn) investigates whether a dynamo powered by top-down freezing can explain Ganymede’s present-day magnetic field. Figure 1 Two top-down freezing scenarios: Fe snow (top) and FeS layer (bottom). Pictures in the left denote states with an active dynamo, while pictures on the right show states with no active dynamo. Yellow and orange areas indicate liquid core alloy, where brighter areas correspond to higher sulfur concentrations compared to darker areas. Dark grey depicts solid iron (top). The hatched illustrates the solid FeS layer (bottom). The dashed circles with arrows indicate compositional convection, which powers the dynamo. Two different top-down freezing scenarios can be envisioned depending on how much sulfur is in the core. If the core is iron-rich, then solid iron may form as free crystals at the top of the core (Fe snow regime). The region where iron crystals form is called the snow zone. The heavy iron crystals sink through the snow zone until the conditions are such that they remelt. Melting of iron defines the bottom of the snow zone. The remelted heavy iron crystals trigger compositional convection in the deeper core below the snow zone. With ongoing cooling of the core, the snow zone grows at the expense of the deeper, liquid core and eventually an inner, solid iron core is formed by the accumulation of iron crystals in the center. A peculiarity of the Fe snow regime is that compositional convection only lasts as long as the snow zone needs to grow across the entire core. This means that the maximum lifetime of the dynamo is limited by the growth of the snow zone. If the core is sulfur-rich, solid iron sulfide (FeS) forms creating a solid layer at the top of the core attached to the overlying rocky mantle (FeS layer regime). The formation of this layer releases heavy liquid iron at the solid-liquid interface, which eventually leads to compositional convection in the deeper core. The associated dynamo can theoretically operate until the entire core becomes solid given that enough energy is available, i.e. compositional convection is vigorous enough. Consequently, the dynamo in the FeS layer regime is not as restricted in time as the dynamo in the Fe snow regime. 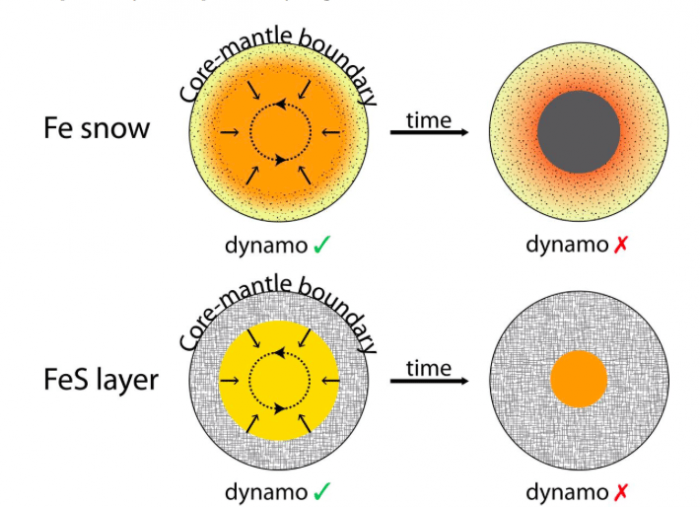 The authors studied the timing of the dynamo by developing a coupled one-dimensional thermo-chemical evolution model of Ganymede’s mantle and core. Based on this model, the authors can calculate the power available to the dynamo as a function of time. This power is then used as an input to magnetic field scaling laws to answer the question whether a magnetic field generated in the Fe snow or FeS layer regime can exist, today. Thermal evolution models usually allow for a wide range of admissible input parameters because the initial conditions, as well as many material parameters, are not known. The authors, therefore, make use of a large number of Monte Carlo simulations, where each simulation is a pseudorandom combination of these parameters. A simulation is called “successful” if it explains a present-day magnetic field. The main finding of the study is that the Fe snow, as well as the FeS layer regime, can explain Ganymede’s present-day magnetic field. Successful Fe snow and FeS layer models have sulfur concentrations between 4-19 wt% (percentage by mass) and 26-36 wt%. All successful models show a correlation between the initial core sulfur concentration and the reference viscosity of the rocky mantle. The latter controls the efficiency of mantle convection, and thus the degree of core cooling. The lower the reference viscosity the more efficient mantle convection and vice versa. Figure 2 The age of the dynamo for successful Fe snow models (a) and successful FeS layer models (b) as a function of initial core sulfur concentration. An age of 4500 Myr corresponds to an old dynamo starting at the beginning of Ganymede’s evolution. Republished and modified with permission from Elsevier. The lifetime of the dynamos is the most significant difference between the two freezing scenarios. While dynamos in the FeS layer regime can be active for long periods of time (several thousand million years), they are strikingly short-lived (less than one thousand million years) in the Fe snow regime. The latter is owed to the fast growth of the snow zone and the associated cessation of the dynamo. If the presence of the magnetic field has influenced the surface, it might be possible to determine the age of the dynamo and to distinguish the two top-down freezing regimes. The study is an important step towards exploring alternative core freezing mechanisms that are fundamentally different from Earth-like bottom-up core crystallization. The results show that top-down freezing is important for small planetary bodies with metal cores, and last but not least, they provide a viable explanation for Ganymede’s puzzling magnetic field. These findings are described in the article entitled Top-down freezing in a Fe–FeS core and Ganymede’s present-day magnetic field, recently published in the journal Icarus. This work was conducted by Tina Rückriemen and Tilman Spohn from the Institute for Planetary Research, DLR, and University of Münster, and Doris Breuer from the Institute for Planetary Research, DLR. Tina is a research scientist at the Institute for Planetary Research, DLR, and University of Münster. Doris is the department head of Planetary Physics at the Institute for Planetary Research, DLR. Tilman is the director at the Institute for Planetary Research, DLR.